For most fighters MMA is not as much a financially orientated career choice as it is a way of life. Despite dissenting voices from a few on the UFC roster concerned that the remuneration compares unfavorably with the MLB, NBA or NFL, there are many more who are simply happy to be able to make a living doing something they love. 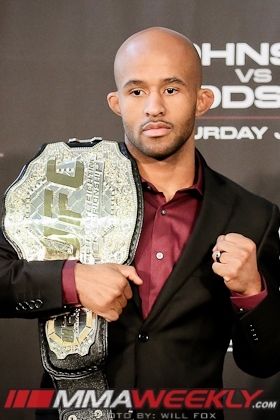 UFC flyweight champion Demetrious Johnson falls firmly into this category. As he prepares to defend his title in the main event of the UFC on Fox 8 card in his hometown of Seattle, the 26-year-old has no complaints with his current salary situation, preferring instead to count his many blessings. Johnson knows better than most what it means to be in a position where he is financially able to focus full-time on his MMA career because it hasn’t always been this way. The first time he walked into the AMC gym, Matt Hume famously told him to quit his day job because he was going to be a champion, but it would be another four years before “Mighty Mouse” was able to follow that advice. 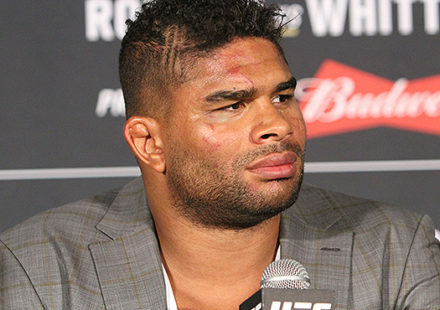 Johnson was still doing regular work right up until the point he was offered his first shot at a UFC title, challenging Dominick Cruz for the bantamweight belt in October 2011. “I was working at a recycling plant, doing construction, and after I fought Miguel Torres I went to work with my broken leg. When I was getting ready to fight Dominick Cruz, that’s when I stopped working and took on training full-time, almost two years ago,” he said. To put this into context, Johnson fought three times for the WEC and twice for the UFC at the same time as working a full-time construction job. 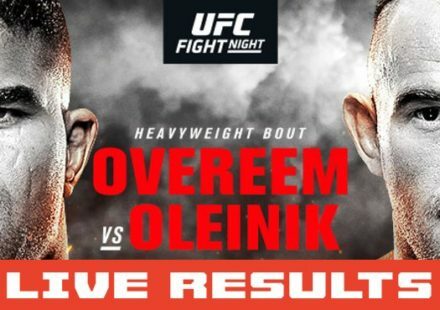 As if that weren’t impressive enough, he also beat some of the best bantamweights in the world during this period despite, at just five-foot-three, clearly being better suited to a lighter division. The decision loss to Cruz was the second of Johnson’s career, with the first coming at the hands of Brad Pickett in his WEC debut. Sandwiched between these defeats were four straight wins in which he proved emphatically that speed and movement could compensate for a lack of size, but it was still a pleasant surprise when the call came to drop down to 125 pounds. 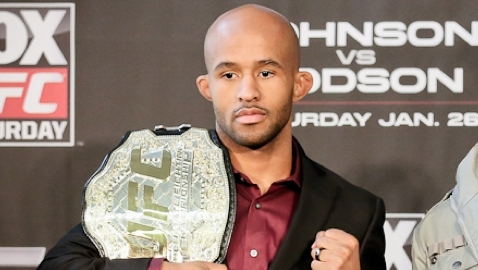 In his first title defense after winning the four-man flyweight tournament last year, Johnson faced John Dodson at UFC on Fox 6 in January. He had to survive a second-round scare after being dropped by two left hands in quick succession, but says that he was never in danger of being stopped by the TUF 14 winner. Johnson recovered and came close to finishing Dodson with a late onslaught of punches and knees. The referee was taking a very close look at the action, but he couldn’t quite close the show, making it the seventh bout in succession that he has gone the distance. He has picked up two Fight of the Night bonuses since signing with the UFC, but has yet to register a stoppage inside the Octagon, something Johnson attributes to the quality of his opposition. Johnson’s current status as UFC champion means that, until someone beats him, all his fights are going to be five-rounders. This presents a problem for opponents because, while it’s difficult to identify a major weakness in the game of Mighty Mouse, his stamina could well be his single greatest strength. Johnson has shown in his two title fights that he has the capacity to attack relentlessly for 25 minutes if he has to and says that this staying power is a legacy from his school days. The next opponent faced with the unenviable challenge of matching the perpetual pace that Johnson sets is John Moraga, whose only career loss came in a 2010 decision defeat at the hands of Dodson. Their 125-pound title fight will be the main event at UFC on Fox 8: Johnson vs. Moraga, which is set for July 27 at KeyArena in Seattle. Another member of the AMC team has an assignment on Friday night, when Bibiano Fernandes fights for the interim One FC bantamweight belt in Manila. Only one weight class separates the two, so they train together whenever their schedules coincide, and Johnson believes he is fortunate to have such an accomplished athlete in his camp. 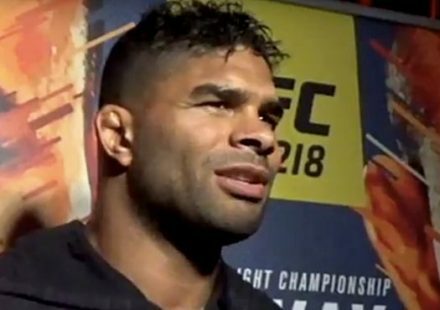 Johnson has lived in Seattle all his life and will be headlining a card in his hometown for the first time on July 27, but it won’t be the single most significant event to take place in the life of the champion that month because his wife is seven month’s pregnant and set to give birth just 10 days before the weigh-in. “The baby is due on July 16, but both me and my wife know that this is what I do to provide for my family and we’re going to do our best to make sure that we’re ready for this fight and my baby too,” he said. For Johnson, being able to balance these various commitments is particularly important because he never knew his own father and is determined to offer his child a more stable domestic background than the one he grew up in. Demetrious Johnson is constantly counting his blessings, which currently include an expectant wife, a UFC flyweight title, and in Matt Hume, a coach and mentor who has always believed in him. For many people being a successful MMA fighter, let alone a champion, is a distant dream, yet the fortunate few don’t always acknowledge their privileged position. Mighty Mouse is an exception. There is no question that he is enjoying life, but on the days when training is tough and he grows tired, he doesn’t have to delve too deep to find a reason to be cheerful.